On December 9 and 10, I joined a group of roughly 50 Methodists (predominantly United Methodists) and 400 interfaith leaders from around the United States and Mexico for an event in San Diego and at the border with Tijuana called “Love Knows No Borders”. The event was organized by the American Friends Service Committee (AFSC), a Quaker peace organization which draws “on continuing spiritual insights and working with people of many backgrounds, (to) nurture the seeds of change and respect for human life that transform social relations and systems”. AFSC worked in collaboration with faith-based organizations around the US to coordinate not only a day of action on the border on December 10th, but a full week of action around the country between the 10th and the 18th, International Human Rights Day and Global Migration Day. The basic tenets of the week of activities are based on the idea that all migrants (in all areas of the world) have the right to flee violence. That is part of what the UN treaty about International Human Rights is all about. Also, it is completely legal for people to seek asylum in countries that have signed that treaty. It is illegal for countries to block people fleeing violence to seek asylum. Other things ASFC and its allies were asking for included the de-militarization of our border communities and defunding ICE and Customs and Border Control’s detention and deportation practices. On my trip I heard stories from migrants as well as from pastors, lawyers, and others who work with the community. I met a pastor from San Antonio who flew to Mexico in November and traveled with the migrant caravan for several days to learn about them and experience just a small part of their journey. And most importantly, I prayed with my siblings at the border. Facing Customs and Border Patrol officers in full riot gear, I sang songs of love and unity. When they forced our line backward, my colleagues held strong, some being pulled through their line, faces planted in the sand, to be arrested in solidarity with our migrant siblings currently detained by our government. 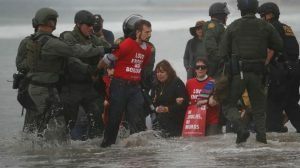 And when Bishop Carcaño asked for some Methodists to kneel beside her in the water to pray, I knew I needed to go, even if that put me at risk for arrest. It was one more way of witnessing to our friends on the other side of the fence that we saw them and we heard their stories. People asked me if I went because I am opposed to President Trump. The answer is that it is not that simple. Yes, the border enforcement has gotten more strict and the situation is more dire under Mr. Trump, but our nation’s immigration policy has had problems since long before him. We have never had a simple, non-prejudiced way of allowing all people equal access to citizenship as Americans. We have always played favorites of one group over others. A brief tour of our history shows how my own very white family were all at one point or another the “others” who were unwanted by many in our society (whether because they were French-Canadian Catholics or because they were Irish or because they belonged to some other less-desirable ethnicity or group at that time). Currently, “brown people”, specifically Hispanic and Latino persons from south of our border or Arabic persons, especially from Muslim countries, are the least desirable immigrants, according to national policy. In other parts of our history people descended from Africa were among the least desirable. And our immigration system set up quotas and loopholes to control who got in and how. Over the years, the system got more and more complicated so that there is no longer a single “line” for someone to wait in, but rather an entire quagmire to wade into and hope that it does not swallow you and your family whole as you try to navigate it. I did not go to the border because of immigration policy. I went to the border because of people. I went to the border because God calls me to love my neighbor. I went to the border to testify to that love. And I am so grateful for the experiences that I had while I was there. I pray they will not be my last opportunity to walk alongside my migrant neighbors on their journeys to wholeness in their new land. 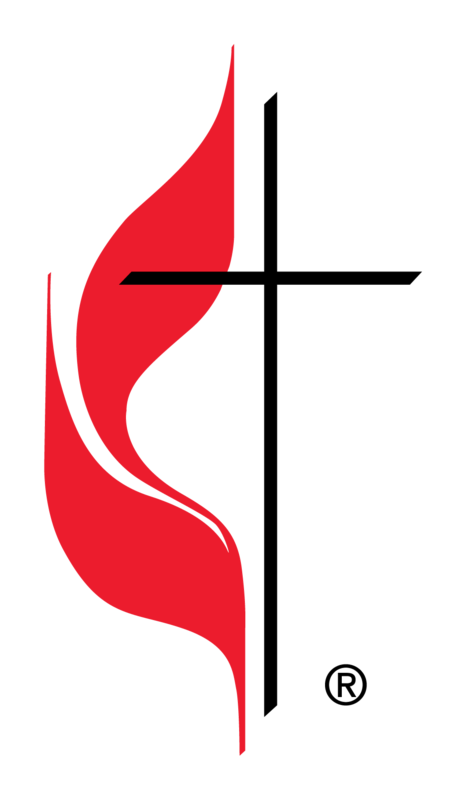 For more information about my trip, see the United Methodist News Story here.